I think I'm writing two books now!!! I've had a running relationship for years with Go Daddy...reserving numerous Domain Names, as I've dived deeper into the subject of ATTENTION... Now that I'm actively involved in re-organizing old files, articles and tons of research, I'm really looking at different ways to communicate what I want my audiences and readers to grasp, grok and own. There are dimensions to attention....that's for openers. That is how I see it!!! That's worth pondering, I hope!!! I've been asked to write a book as an expert, using 15 Tips as my content. I'm thinking about this every day and while it's a challenge, I like challenges... The other book is a bigger book with lots of research, illustrations and content...I am still organizing, which means I get to choose lots of content I've saved and haven't seen in years...If I give it a second life, it's got to be especially good! This information is too scary to withhold. Please read it and pass it along. People Learn to Give Themselves the Kind of Positive Attention They Need! Actor Michael Keaton is quoted in People Magazine: " he could talk 'for hours' about his passion for fly-fishing, which he likens to meditation. It's like when your acting is really, really good, he says. It's close to that." Jose Santos - on being the soloist in "Chaconne" (Dance Theater of Harlem Dance Company...In conversation with Colin Connor, artistic director of the Limon Company) 'It's impossible to hide in the solo; it has a formality to it that emphasizes line, but it also deals with the idea of building momentum. Mr. Santos said he had to find a way to understand that the positions in the work are more than poses, but feelings. We Have To Wake Up and Pay More Attention. Heath Ledger Did Not Need To Die! Heath Ledger was recently on the cover of People Magazine, 4/24/2017; I was both surprised and delighted, for he has been gone from us for 9 years. I needed to write about him just after he died. We now know all the details of how Heath died. It was an accident. He took too many prescription pills and just stopped breathing. I am feeling very sad. We were really all robbed of watching this extraordinarily talented young man grow into a fully actualized mature actor. I have read that he shared considerably about the stresses he felt in his recent role as the sociopathic Joker in the upcoming " The Dark Night." He talked about this role being an exhausting experience that often he was unable to talk or move after certain days on the set. He told both New York Times reporters and a national television program that he was taking the sleep aid, Ambien, to help with his sleep deprivation. He sometimes couldn´t sleep more than two hours at a time and couldn't turn off his mind from continual thinking. He also was not feeling well, recently in London, according to a fellow actor, Christopher Plummer; supposedly he was suffering from walking pneumonia, before he flew back to New York. The pills the police found in his bedroom were all prescription drugs for anxiety and sleeping: Valium, Zoloft and Ambien. I wonder why he told so many people how much he was struggling with feeling so stressed out. Could he have been asking for help in a very subtle way? We all have friends and relatives who sometimes are so busy and involved with their business lives that they don´t realize what their bodies are saying to them. I can only imagine that Health´s stress was compromising his immune system. He was sick enough for his fellow London actors to know he had a "bug" that he could't shake. I remember the story of the shocking death of Jim Hanson, who created The Muppets. He coughed for so long, continuing to work, that when he finally went to the hospital, it was too late to save him. It´s not enough that we just notice anymore; I think it´s time that we really work at being active, conscious, personal ombudsmen for the people we care about in our lives. I have heard a noted speaker, David Wolpe, say that "Paying attention is a moral value." When we really pay sufficient attention to feel the concerns we have, we can give ourselves permission to create "social interventions." Sometimes it´s necessary to ask permission to have certain conversations. For instance, "Could we talk about how you´re feeling?" "I heard that you´ve really been stressed out from that project you´ve been working on; is there any way I can help or do anything for you?" "I want you to know that I care very much about how you´re feeling, and I have seen how hard you´re working." It´s vital to build safe and honest communication in your relationships to listen, to be heard, to be trusted. Our worlds are going so fast these days that we are losing our connections with ourselves and with others! We just keep doing more and more, going more and more, rushing more and more without stopping to take quiet, reflective, regrouping time. We´ve stopped saying, "No," when we really want to and need to. I think hearing that Heath had scheduled a massage for himself was certainly an indication he knew he needed some quiet healing time. It was just too late! I read that he had some more pills prescribed in Europe, which means that he probably visited a physician there. I wonder if his doctor-visit included some time to talk about the work stresses he´d been feeling, the insomnia he´d been experiencing and whether or not he needed to postpone his flight back to New York to recover from his walking pneumonia. What if¦? Personally, I wish that he had seen an acupuncturist or another kind of healer in London, who might have advised him to rest for a time before he flew again. This time in Heath´s life was ripe for a social intervention. He could have used a "time out" or time off to unwind, to get his mind and body back in sync. First, we all need to practice social interventions personally. We´re so busy with the technological aspects of daily living with our cell phones, our iPads, our computers, that we´ve stopped paying attention often to how we´re feeling. We need to be reminded to just plain stop doing what we´re doing, to eat, to take a nap, to smell the roses, to chill out, to listen to others to really hear what they´re saying to us. We might even schedule such times in our calendars! Listening can be called a major social intervention, for when we listen, we´re paying attention to another, we´re in the present, and others actually can feel our connecting. And that´s what social interventions are all about connecting!!! Whether we´re teachers, physicians, relatives, friends, parents, service personnel, we need to consciously connect to the people with whom we interact. People are acting out today in such diverse ways to get our attention, to ask for help, whether it´s through drug and alcohol abuse, bizarre dress and behavior, eating dysfunctions, anger, drama, suicide attempts. Once we realize that the kind of attention we get and give is the root cause of our feelings and behavior, we can make huge differences in the quality of our personal lives and in all the lives we touch every day. Start by saying hello to the people you interacts with today: the newspaperman, the parking attendant, the checkout people, the doorman, the dog walker, teachers, nurses, old people, and kids. Know that paying and giving appropriate and positive attention can and does save lives! Wonderful Videos Demonstrating the Power of Positive ATTENTION!!! In only one day I posted three different videos .....that clearly how the reactions of people getting the kind of attention they needed.....smiles are abundant!!!! Years ago, there was no such thing as parenting. The industry of parenting… Parents needed kids to help them—to work on the farm, to do jobs, to support their family structure. They needed kids to bring in money, but that’s about as far as parenting went. And as times progressed, people parented intuitively, or like they had been parented, which had very little thought behind it. The history of parenting in this country includes parents in apartment dwelling, putting their children in cages, suspended in the outside to air them. But they left them there for eight hours. And then when survival no longer depended on needing kids around, people started to think about how they felt. And how their mothers treated them. I think Freud in the 1920s was the first person to really make an impact about thinking about childhood. So it’s been the last 100 years when we really started to experiment, talk about, and think about, how we were parented. This is new. What we do with a child, that child remembers. What we give to that child, emotionally, physically, and often gift-wise, that child remembers. Everything that we do and everything we don’t do... One of my audience members told me that he was obsessed with building models. He related a story about when he was a child, and it was holiday time, his parents would ask him what he wanted. He would make a list for them, on which he would write down the numbers of the models he wanted. He never got them. He has never forgotten that. You know, when soldiers came back after WWII, they had left their parents in charge of some of their belongings (e.g., guitars, pets, etc. ), and when they came back, and the pets were gone, and the guitars were gone, they were crushed. And often, their parents said, “We didn’t think you were coming back.” It gets to go from an emotional to a physical hit. Emotional damage can feel physical, and this is not without reason. Innumerable studies have demonstrated the negative health effects of emotional harm, such as an increase or decrease of certain key chemicals in the brain, in addition to higher blood pressure and an increased rate of heart attack or stroke. Funny how certain e-mails arrive, and I stop all other activities I’ve been engaged in…. Another e-mail video arrived showing how kids and even grown-ups react when they receive a puppy as a gift; all girls started to cry with happiness and joy…the one young boy just fell down and started giggling, while holding his wee bull dog…!!! Jenny Radesky, clinical instructor in developmental-behavioural pediatrics atBoston University School of Medicine, published her team’s findings. She urged parents to increase “direct human to human interaction” with their offspring. Radesky encouraged more “unplugged” family interaction in general and suggested young children may benefit from “a designated family hour” of quality time spent with relatives – without any television and mobile devices being involved. Radesky questioned whether the use of smartphones and tablets could interfere with the ability to develop empathy and problem-solving skills and elements of social interaction that are typically learned during unstructured play and communication with peers. Mr. Masser was a very successful stockbroker in New York who biked to work in Midtown Manhattan in the 1960’s. He often would detour to the Juilliard School to putter on the piano. He taught himself to play the piano, even though he couldn’t read music, but an inner muse was urging him to switch careers (he had earlier dropped out of law school). He had the perfect life, or so everyone thought. He had a great job, a growing family, a wonderful apartment and a farm in Vermont. He was unhappy, and someone he knew convinced him to see a shrink. And it’s funny, he thought, because that’s all he was looking for…permission…He had been the dutiful son and husband for so long…He’d forgotten about living for himself. He found a mentor and soon began composing ballads with epic range and scope. Whitney Houston, Diana Ross, Roberta Flack all recorded his famous songs. Somehow, he said, people get very nervous about leaving the comfortable life of rules behind and never take the chance to develop their own internal voice to listen to their own consciousness! 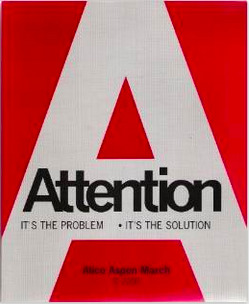 Many years ago, before I moved from Los Angeles to New York City, I created a Workbook, Attention: It’s the Problem – It’s the Solution. Unfortunately, we didn’t market it very well, but the people who did buy it, wrote fine reviews. They seemed to realize much more than they ever anticipated about the attention they got related to their role modeling. “Thank you for sending the Attention Workbook. It has so much information to discover that I can hardly wait to dig into it. I mentioned it to a cousin of mine who had less attention than I did and she immediately said, “That’s why I did all those things that brought me negative attention. I didn’t get any attention, if I got good grades, but when I was doing poorly, they all gathered around me!” She’s been in therapy for years, and I’ll bet this is the first time she’s realized what she was doing and why! There are lots of copies stored away in my son’s attic in Texas. …I sense there’s a call for marketing action here!!! Do you know someone who's going away to college? Beginning college is a scary and exciting time. For many students, it will be their first time living independently, and they'll be experiencing the pressures of a new environment, harder classes, a heavier workload, and making new friends. Navigating the increasingly challenging college landscape is difficult, not only for students, but for their parents, as well, who often don't know how they can most effectively support their kids. This is why I've created Attention: Secrets for Making it in College and Beyond. This short book is like a manual–a personal mentor–that will help both students and parents know what to expect, and enable them to meet these new challenges head on. Watch the video below to learn more. If you, your child, or someone you know is going off to college for the first time, this book will be an invaluable resource. Find it on Amazon, or click here to purchase it now! July has found me busier than ever, working on a new book for new parents called Looking Ahead: Practice Positive Parenting. Consequently, the theme of this month's newsletter is children and the special kinds of attention they need. While every child has his or her own needs for certain kinds of attention, there are some things that we all have in common, and when a child's needs are met, you'd be surprised what can happen! Fearless Frosty is about Anna Frost, a mountain runner from New Zealand, who trained hard to achieve her lofty goals, despite being told, as a child, that women could not excel at sports. This is just one book in the SISUGIRLS series, which will aim to provide young girls with stories about strong female role models. Sisu Girls, run by Chloe Chick, is still fundraising for this remarkable series, and if you would like to contribute to an amazing campaign, you can donate here at Indie GoGo. You can support Chloe with a $2 donation, and for $30, you can get your own copy of Fearless Frosty. To learn more about Sisu Girls, and the awesome work they're doing, check out their website at www.sisugirls.org. Today's another Monday and I'm working on a new edition of my Web site...for the umpeenth time!!! I am totally confronted right now, having had to dig through all my various testimonials, how many people wrote telling me how much they benefitted from my workshops, presentations, coaching; I almost cried at some letters I found. I just didn't follow through with MORE...of everything. I promised to finish the book I was writing on TheAttentionFactor(R); I never did. Instead, I moved to New York City, a place I lusted to live in, probably, ever since I first met it, when I was 14 and came to visit with my parents from Detroit. This site is brand new, and so is this blog! It will be updated shortly, so stay tuned!